This book has about 400 pages which full of words and only has two colour, black and white. But, this words integrate become a beautiful sentences, and paragraph that full of sense then has many colour from different situation. Made everyone who read this book couldn’t stop his tears and enter to situation that told this book. Novel which tell a true Indonesian muslim who study in Egypt, his name is Fahri. He is a true muslim and has real vision about his future. He always protect his self from desire that “approach” a girl who not muhrim1. From this attitude, Fahri got a pious girl and she become his wife. Their life after married is full of happiness. This is a reply for this attitude. But, their love and taqwa2 are tested by Allah. In this part, their offering and struggle of love made this story full of sense. This novel is a wonderful writing work that full of Islam nuanced and near to propagation. Propagation which give slow but sure and kind. Slow but sure can go to heart and conquer the reader. This novel give “the really future” for everyone who obedient to Allah’s commandments. Has a persuasive power, tease the reader become a religious person. Not more than enough if this book call as “conquer book”. Conquer the hard of heart from power of Allah. One thing that hated from this book is a unhappy ending. Made the reader amuse his self from sad that impress deeply. But behind it, found one thing that become lesson for us and wisdom about peaceful life a religious person who is obedient to Allah’s commandments. 1) person who have different gender which not a family or distant relative. 2) attitude that obedient to Allah’s commandments. nice movie, i was waiting for this movie since 2 months ago..
i think they should make an english version of this movie..
my friend introduced me bout this book..
the story inside could make us ‘insaf’..
mm..i think i must have one..
one people from thousand or million people that’s love AYAT-AYAT CINTA!! Included me too.. hhe..
Ok! You’re so so.. so.. great, smart people..
your english good, are you from international class student? 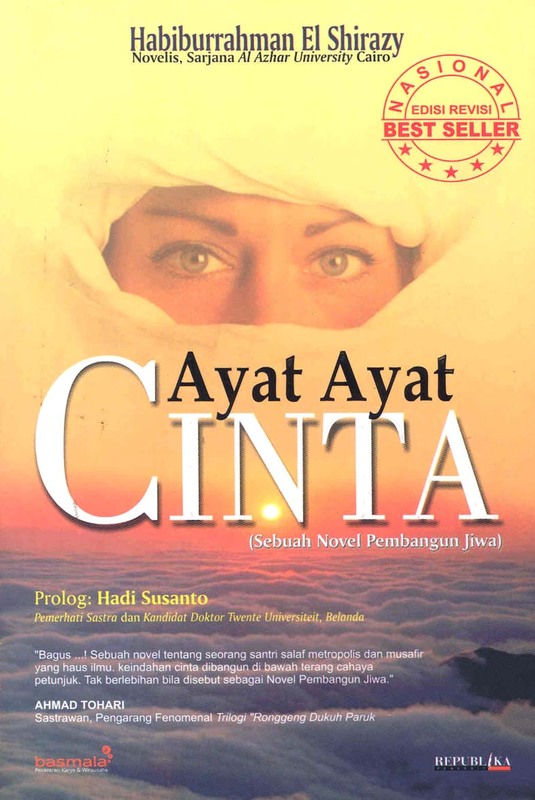 don’t forget, ayat-ayat cinta coming soon at 28 february! 2 day from the explosion! jd terhayu…..,aq liat filmnya yang kluaran pertama dibioskop28feb…! maknanya dalemmmmmm bgt,tp aq msih suka yang novelnya.lebih lengkap..!! aq pngen liat lg sma mazQ rame2……..
somehow it made me realize about evrything..
gud religion approach toward youngstersss…. i would recomment it to all my fren here..
but i think ppl should read than just watch the movie….